Happy Tuesday! Sometimes it seems like all runners talk about is…running (shocker)! But contrary to popular belief, we do things besides run. I enjoy lots of other forms of exercise, and a few other hobbies as well. This week’s Tuesday Topic: What are some of your favorite non-running hobbies? You can write about this topic, or feel free to post any running related blog post. Remember to Link-up with Kim and Zenaida and the bottom of this post! Here are just a few of my favorite non-running activities/hobbies. If you’ve been following this blog for a while, this should come as no surprise! I absolutely love strength training – sometimes I like it more than running. I love feeling strong after a hard workout lifting weights. Not only does this make me a stronger runner, it also makes me stronger overall. When I first started going to the gym, Zumba was my first love, followed by Spinning (running started a few years later). Did you know that I was a certified spinning instructor? I even taught spinning at my gym for a year and then I realized that I much prefer taking classes vs. teaching them. What I love about spinning is that it’s a great cardio workout, builds endurance and it’s less stressful on your joints. Using the Peloton bike for the last year has really made me love spinning even more. Also I find that taking a spin class the day after a long run always helps to decrease my soreness! Tell me: What are some of your favorite non-running hobbies? Topic for next week – What the best and worst race swag you ever received? Make sure you tell us your tips! We hope you’ll link up with us! Wait what? There’s life outside of running? Haha! You already know I was a gym rat before I started running and I took my first yoga class at 19 (although now I’m slacking) . One of my non-exercise hobbies is I’m a master gardener. I LOVE to work in the garden and always have flowers and plants indoors as well. I had no idea you were a spinning instructor! Obviously I love to cook & bake. Pilates. Yoga. I went through a decorative painting phase. Knitting/crocheting on & off. Swimming (it’s just too dang cold here much of the year! Hiking (kind of same as swimming). I do love having extra money in my pocket and good deals are always exciting to come by! I also love to travel and spend time with family! Me too! I wish I could travel more, especially internationally. You’re a certified spinning instructor? WOW!! No wonder spinning is such a big part of your fitness 😉 (unfortunately, I think I’ve finally found something we don’t have in common LOL). You probably know I’m an art geek…drawing, painting, decorating, and anything with color will make me smile like a dork. LOL, i think it’s the only thing we don’t have in common haha. I wish I could draw but sadly I am lacking that talent. I love painting and decorating too! I love tennis but there doesn’t seem to be enough time for it all. I go through phases. I used to be big into quilting. Now it’s just knitting and reading. I have always wanted to learn how to knit because it seems like such a relaxing activity. Couponing, interesting! I need to get better at that. It does seem like running takes over and there isn’t enough time for other hobbies sometimes. I used to be really into photography but just haven’t had time recently. I totally agree! Sometimes I feel very consumed by running so I’m trying not to do that this year! Photography is such a great hobby – I hope that you can get back to doing it more often. haha right?! It was amazing how much they were able to save. It’s definitely a skill and you have to be good with numbers. I did not know that you are a certified spinning instructor. That is so cool. I love Body Pump. I guess that counts as strength training too. My DIL is a big couponer also. She is amazing with all the bargains she finds. I think it would be very satisfying, saving all that money. I think it’s awesome that you go birding! That must be such a relaxing activity. Oh, I’m a birdwatcher too and I left that out of mine! Do you find winter running gear works well for that, as I do?! I’m always super amazed with Extreme Couponing, haha. I’m not of that caliber either but I definitely agree that it’s a great hobby! Yeah the people on that show dedicated SO many hours to couponing – I just don’t have the time, but I admire them! You have such unique activities! I had no idea there was a show about couponing?!?!?! When not running, I am either reading or watching TV. I find those two things relax me and sometimes find myself in a totally different world. It is like I am running away from my problems, but then eventually need to come back to the real world. Yeah, it’s not on anymore but it was on the TLC channel. Funny on the couponing. I quit for the most part, but do check for in-app coupons at the grocery store. You know I love all the fitness activities! I do actually love spinning and need to get back into it when I can make the time (perhaps post-Brexit when I can see where my business landscape has changed or remained). I also like yoga very much. Non-exercise hobbies are of course officiating endurance and track & field, and then also reading and reviewing – I have my book blog plus I review for the online magazine, Shiny New Books. Nice idea for a post and interesting post and comments! 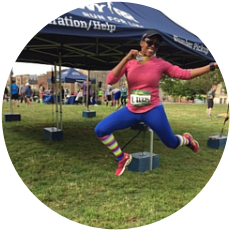 You always have so many non-running activities – it’s awesome! I don’t know how you find all the time. It’s amazing how many other facets we all have! I love spinning too although I haven’t been to a class in a bit. One of my hobbies is writing. I am currently trying to write a Children’s Picture book story. So amazing that you are writing a Children’s Picture book! If I had a life outside of running (which I don’t), it would definitely be being as frugal as possible. We mystery shop and use them as date nights – we get to go out and be social, but we also get reimbursed for our work. I love the idea of doing mystery shopping as a date night! Would love to see you play the piano! I never learned how to play any musical instruments so I always think its so cool when anyone can. It’s always fun to see what runners do besides run. I read a lot, play Words with Friends, and seem to spend a lot of time working on my blog. I used to play Words with Friends a lot. I need to start doing that again! I showed horses and dogs for years. I got rid of my horses and just did dog agility and running for some time but now my kiddo takes all of my “free time” that isn’t running. That sounds like such a cool non-running activity!